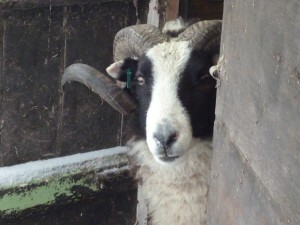 A week of obsessive, compulsive sheep watching and no lambs yet. 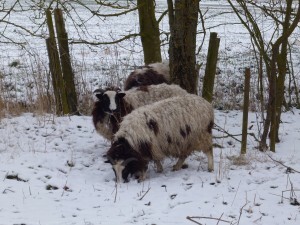 The two ewes with prominent udders look about ready to pop and have developed a distinctly triangular shape from behind. The other ewes are younger and have longer tails so it’s a bit harder to get close enough to see what’s happening with their udders. 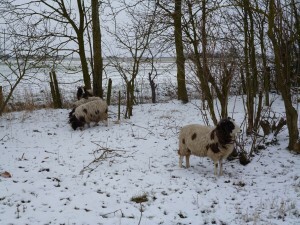 Part of the reason for lambing at the end of March / start of April was that we hoped the weather would be better than in January/ February. Obviously this weekend that turned out not to be the case when we, like most of the rest of the country were hit with blizzards and icy gales. 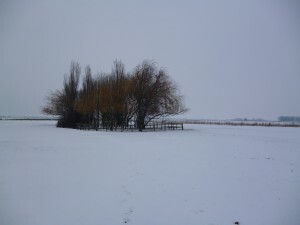 For most of yesterday the snow was falling horizontally. 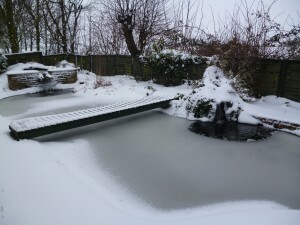 We woke up to a decent covering of snow but it’s already started to melt so hopefully will be gone by tomorrow. It’s still bitterly cold though especially in the wind. 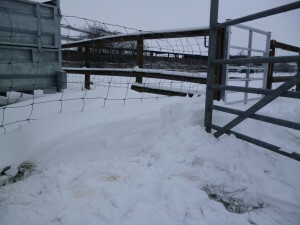 We decided to keep the sheep out. 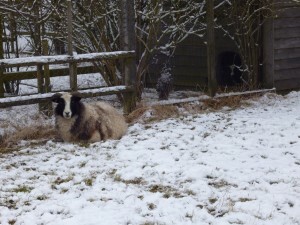 They don’t seem to bothered by the snow and they are very close to the lean to barn, so if any lambs do arrive mid blizzard we can easily get them inside under the heat lamp if necessary. 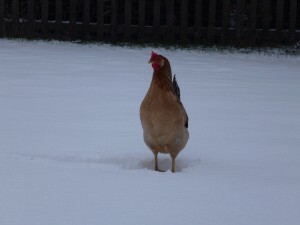 All the other animals seem to take the snow in their stride as well. 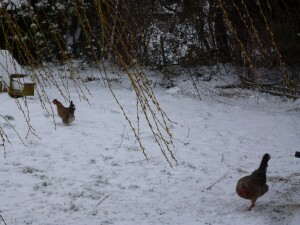 The chickens all move into the large coop when it’s cold, whereas normally they split themselves between the two coops. 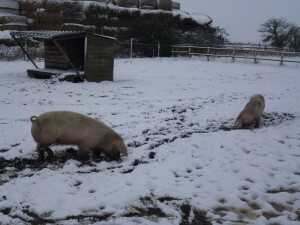 The pigs aren’t keen on frozen ground but quite happy to root around in snow. 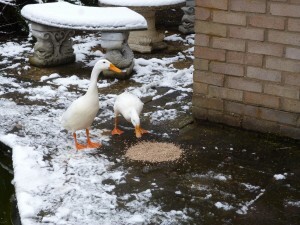 The ducks have now got used to the frozen pond and also like wandering around leaving duck trails in the snow. 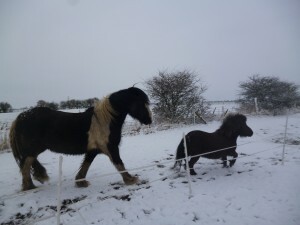 The snow seems to excite the horses they get quite frisky especially if it’s windy as well and Bonnie does like a roll in the snow. 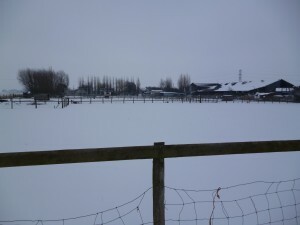 Here’s some pictures of a snowy Hooters Hall this morning. 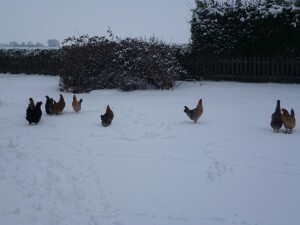 Up until now our chicken flock has been made up of the two Blackrocks that we’ve had for over 4 years now and the 10 Cotswold Legbar chickens that we bought a year ago when we moved to Hooters Hall. 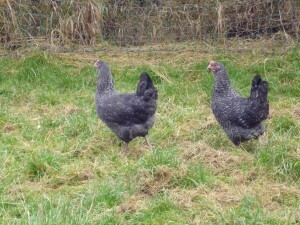 The Blackrocks lay a medium brown egg and the Cotwold Legbars a variety of pastel shades including pink, blue and green. This combination of colours has proved very popular on our farm gate egg stall so when Rachel, one of the Blackrocks, died of old age a few weeks I was keen to find a replacement that would add to our coloured egg collection. 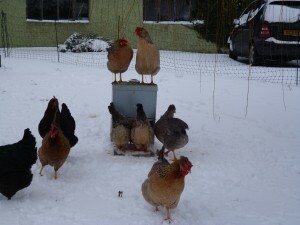 After a bit of research I decided that Marans would be best choice. 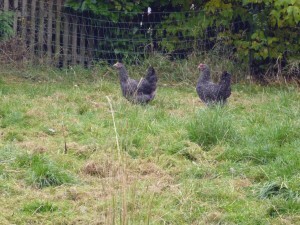 The Marans chicken is originally a French breed imported into the UK in the 1930s. There are 9 recognised colours of Marans chicken in the french standard; Cuckoo, Golden Cuckoo, Black, Birchen, Black Copper, Wheaton, Black-tailed Buff, White and Columbian and it’s a dual purpose bird being suitable for meat as well as egg laying. We’ll be using ours for egg laying rather than meat and the reason why I thought they’d make a good addition to my flock of coloured egg layers is the exceptionally dark eggs that they lay. 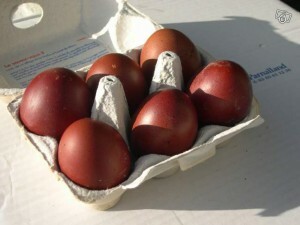 Here’s a picture of some Marans eggs. 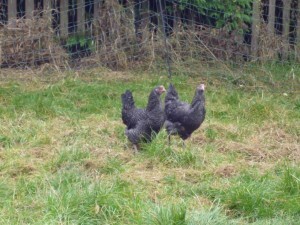 I think they’ll complement the pastel shades of our Cotswold Legbar eggs very well and maybe lead to even more egg sales. Our pair of Cuckoo Marans aren’t quite old enough to be laying yet but they’ve settled in very well and as soon as they start laying I’ll post some pics of the eggs. 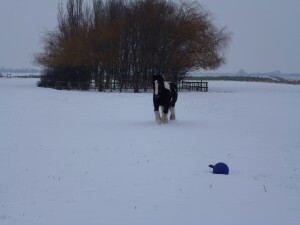 For once the met office got the forecast right and right on cue at 6pm last night it started snowing. 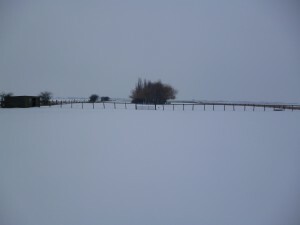 After a few days of seasonally cold weather at Hooters Hall yesterday started off at a toe numbing -8°C. 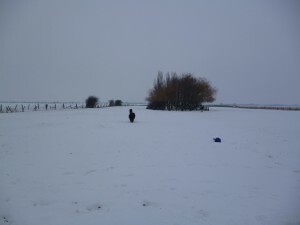 By late afternoon it was a comparatively balmy -2°C and the bright blue winter sky was rapidly obscured by clouds heavy with snow. 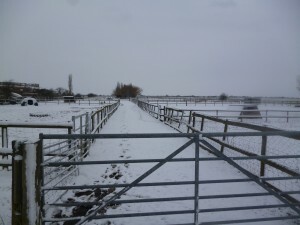 We spent the day preparing for the snow; getting the poo pick done on the horses field, mucking out the chicken coops, filling up the feeders, topping up the straw in the pig ark and making sure all the livestock had access to unfrozen water ( an endless job when it’s this cold). And this is what greeted us this morning. 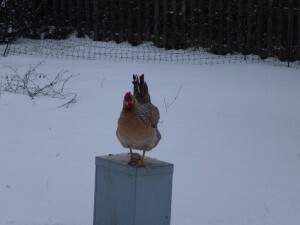 The chickens seemed a bit suspicious of the snow and one in particular has spent most of the morning perched on top of one of the feeders. 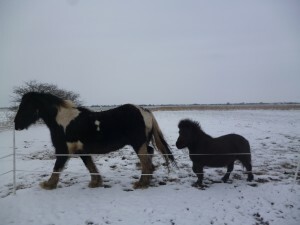 The horses and the pigs don’t seem fazed by it at all though. Here’s a video of the pigs getting their feed this morning.